Every spring and throughout the summer months, different species of bees will emerge from lawns and turf. These bees have been in the ground all winter developing in the third stage of being an insect called the pupa. As the soil warms, pupa hatch. And with the hatching of pupae come adult bees. 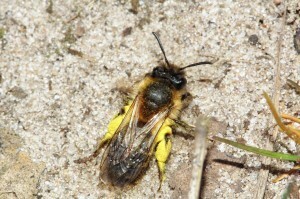 One of the most common is the Andrena digger bee. These bees come in all sizes and colors. Some are black, blue, brown, white and orange, yellow, and probably mixes of any listed above. Digger bees tend to look more like common bumble bees, but can look like a yellow jacket, a honey bee or certain types of flies. Most all of these species have common behavior which make them easy to control and understand. 1) Nearly all are solitary. Although it appears you have thousands of “nests” in the yard, in fact they are all independent nests owned by different bees. 2) Most like to fly around their “airspace” at different times of the day or season. This may have something to do with mating, air temperature or simply staking territory. 3) Most are not too aggressive, but stay clear of them. One never knows if they may be allergic to a certain sting or venom. Don’t let children or pets play around nest sites. 4) The first year these pests start to nest in a yard, they usually go unnoticed. It is easy to miss a few holes. Every year this will grow exponentially. Within 3-5 years, expect to have several thousand! 5) Although nests may be under pine straw or wood chips, most species prefer to dig on bare ground between grass and plants. Holes are easy to mistake for worm castings. 6) Most are predatory feeders foraging for grubs, small flying insects and ground dwelling pests. It is not uncommon for nest sites to be established in a yard which has little food supply. Because they can fly, food can be found in adjoining property. Nest locations may only be taking advantage of the free place to live without offering any help in controlling your pests! Once food is found, it is stung to death, brought back to the nest and buried. Eggs will be laid on it, in it or close to it so that hatching larva will have a ready food supply. 7) Some are pollen or other organic food feeders; not all are predatory. 8) Most nest sites tend to be where sunlight, moisture and soil density meet some requirement they like. Once a nest site is started, expect it to expand each year and become larger and larger. Although nests are abandoned each year, they are not reused. New nests will be made adjacent to old nests and most old nests fill in over the winter. 9) Expect populations to vary from year to year, based on things such as the severity of the past winter, local insect levels, rain patterns, humidity and temperature. 10) Most live a full year, emerging from pupa stages in the spring, building nests, laying eggs and then dying in the fall. Their offspring will emerge next year to continue the cycle. 1) Most people fear their presence. Although they usually will leave you alone if you don’t bother them, nests pose a hazard when built in play areas of the yard. 2) Infestations will start small and rapidly grow. If you have a nest or two, expect to have several more in the next year. This will quickly grow out of control if left alone to develop. 3) Nest sights will become unsightly. It is not uncommon for thousands of holes to be created within a few thousand square feet. 4) Large nest sites are scary when the species nesting goes into their hovering activity. During these times, you will expect to have thousands of them flying low to the ground, around 1-3 feet high, simply flying in circles. Be sure to keep children and pets away during this activity. 5) In every case, small infestations will eventually get too large and move into areas of the yard where you don’t want them. Be sure to prevent this by taking care of initial infestations before they grow. If all you have is a few holes – less than 30 – and you want to get control of the problem before it gets control of you and your yard, get some DELTAMETHRIN DUST. This product works fast, lasts long and will kill off all which are active at the time of treatment. Just 2-3 “puffs” of dust down every hole you can find will take care of the nest immediately. Use a good HAND DUSTER to apply the dust. And treat at night, close to dark, when the bees will be inside their nests. Deltamethrin dust will work even if it gets wet. And though it will hold up well to water and moisture, plugging it will insure it lasts that much longer just in case it rains or if you have an irrigation system. 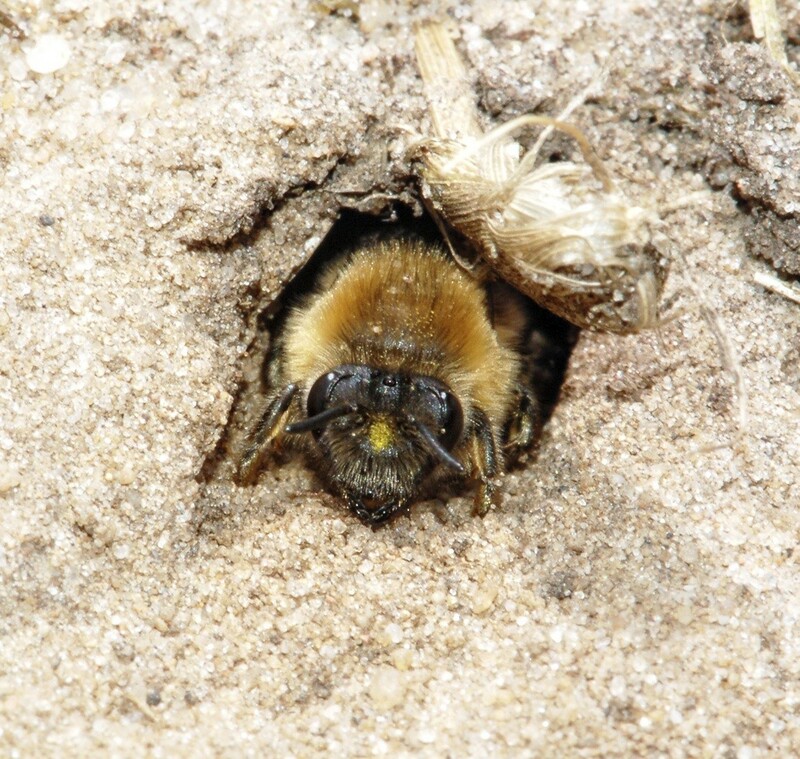 Digger bee holes are generally small and easy to “cover up” which should be done within one day of treating. Since most nests have eggs and pupa which are still developing, having the dust in the nest for extended periods of time insures there is something around to knock out young that will hatch throughout the season. And by capping off the top entry hole after the hole is treated will help the dust to last longer. Once treated, most nests will die off and show no activity within one day. However, it is common to have new holes “pop” up from nowhere within a week which will need immediate attention. Furthermore, if the nests treated have a lot of eggs and pupa developing, you will assuredly get some new nests at some point in the future so be prepared to treat in the coming weeks. If you have 50 or more nests and you are uncertain of every hole entry point, broadcasting ADONIS over the yard will prove to be a big time saver. 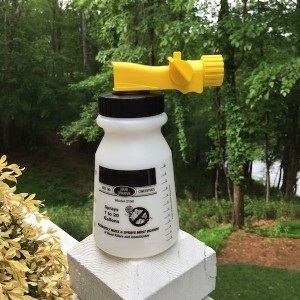 This non repellent can be used down bee or wasp holes in the yard as a drench but for large problems, spraying it over the grass, mulch and pine straw will get all active bees too. Adonis uses a unique “non repellent” active so the bees won’t know its present. 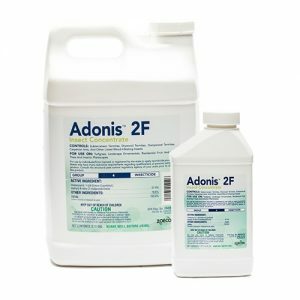 Adonis is labeled for use on turf grass for a range of insects including grubs so for long term control, Adonis is well suited. It will not only kill the active bees digging and nesting but months later it will still be active enough to kill the hatching young. Using a good HOSE END SPRAYER, you’ll need to add 2.5 oz of Adonis to the sprayer and then fill it to the 5 gallon line. Next, hook it to your garden hose and spray the entire amount over 5,000 sq/ft of turf. It’s important to understand that the water used to apply the spray will serve you by carrying the chemical down into the soil. This is important to ensure all the hatching young will be affected in the future. And where possible, spray directly down any holes you see. Treatments done early in the year will help stave off the spring hatching so if you have a history of problems, get the yard treated in April-June and you should be able to keep activity minimized for the entire year. Since Adonis will control any type of “plant” eating pest, it will help keep your yard happy and healthy as well. Apply Adonis using a good PUMP SPRAYER. Remember, 1 gallon of mixed material for every 1,000 sq/ft. For large yards, use a good HOSE END SPRAYER. 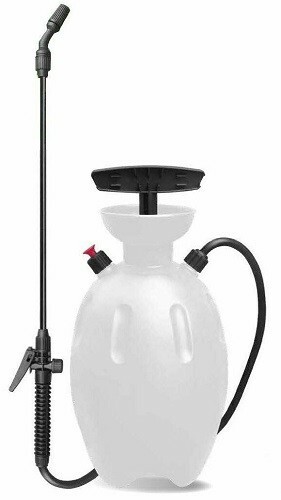 Using our sprayer, you’ll need to add 2.5 oz of Adonis to the tank and then fill it with water to the 5 gallon line. Next, hook it to your hose and apply the contents over 5,000 sq/ft of turf. 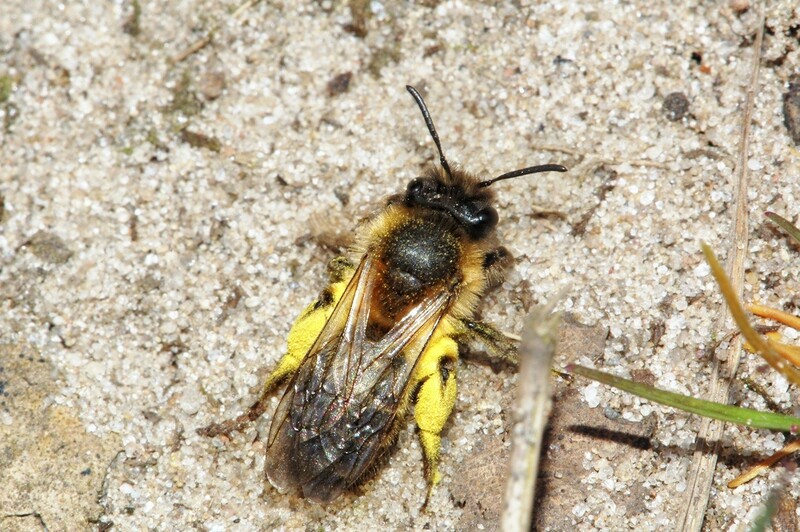 Lastly, its important to understand that digger bees will be marking infested areas as a good place to nest which will make the yard attractive to bees in the community. For this reason problems will tend to be ongoing once you get active nests. To prevent this from happening, get all active nests dusted with Deltamethrin Dust if possible but if you cannot locate all nests, broadcast Adonis for long term control. 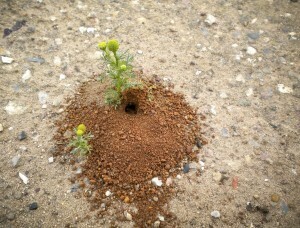 I am going to try to eliminate a digger bee nest on my lot. I will try to order materials tomorrow when I get paid. I have a question regarding the “corks” spoken about on the website. The opening to the nest is about the size of a baseball, so I think corks are out. 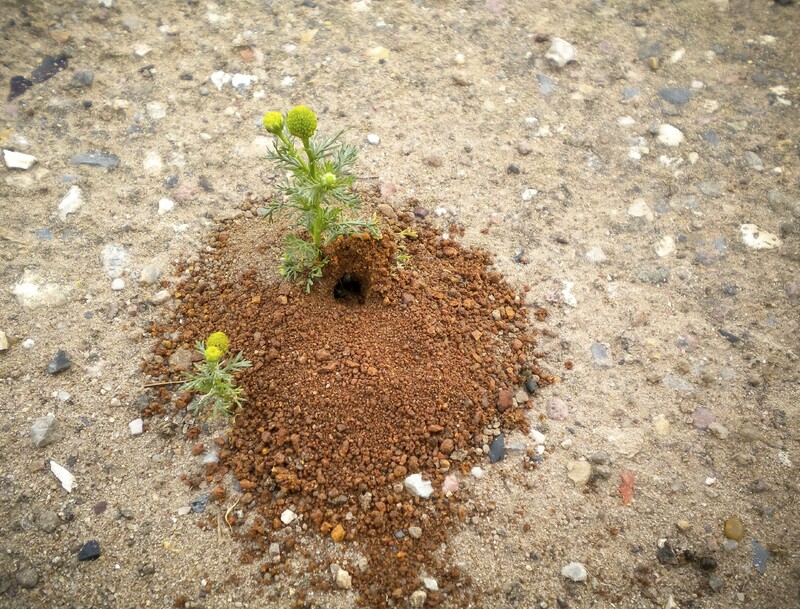 While I find most of nature interesting, I see a threat here as my Jack Russel Terrorist thinks that the bees have been provided as “entertainment” and I watch her standing in front of the hole like a commuter waiting for the next train, then chasing them. How would I plug a large hole, and do I need to find the bees “emergency exit”? Based on the size of the hole you’re describing, I suspect you have yellow jackets. 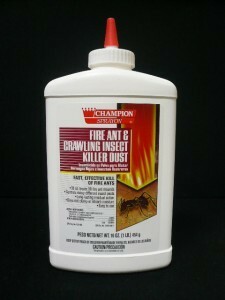 And if you read our yellow jacket article, you’ll learn we recommend dusting them with Drione. As you’ll see in the video we posted, the dust will kill the nest on contact so within a day, it will be dead with no subsequent activity. At that point you only need to place some dirt in the hole and you’ll be fine; no need to worry about some kind of emergency hole or other passage way either. Now if you have multiple holes that large? Please take some pics and send them to us as we’ll need to look. But common digger bee holes will be small and in big numbers which is why the corks are useful. But corks are not needed when dealing with 1-2 yellow jacket holes. Have these bees been known to take over paver patios? We killed a black digger bee and pulled up one paver brick. There was rolled leaves under the brick with larva in them! My patio is sinking in places. If given the chance, digger bees will definitely undermine pavers and eventually cause them to sink. For this reason its wise to treat active nests with the dust listed above. Its easy to apply and fast working. Use it on any hole you find throughout the warm season and you should be able to keep them away. Is there any treatment for digger bees that should be applied in late summer or fall to kill the larva and prevent spring hatching? Or should all treatments take place in the spring and summer? Treatments should be done anytime you see holes. So are the holes still visible in the yard and/or do you still see bees using them? If so, get them dusted with the Deltamethrin Dust listed above. Remember, there are developing eggs deep down in the hole and the only way to reach these eggs is to treat with the dust. So if you still see holes, get them dusted now. This will be the best “preventive” treatment you can do right now since each hole could be developing 5+ new bees. Hi. I think we just killed the last of our digger bees, as no holes have re-opened for several days. My only concern is that eggs may have already been laid (it’s August 20). It seems as though the bees came a little late this year compared to past years. When do they typically lay their eggs compared to when they originally arrive on scene for the year? 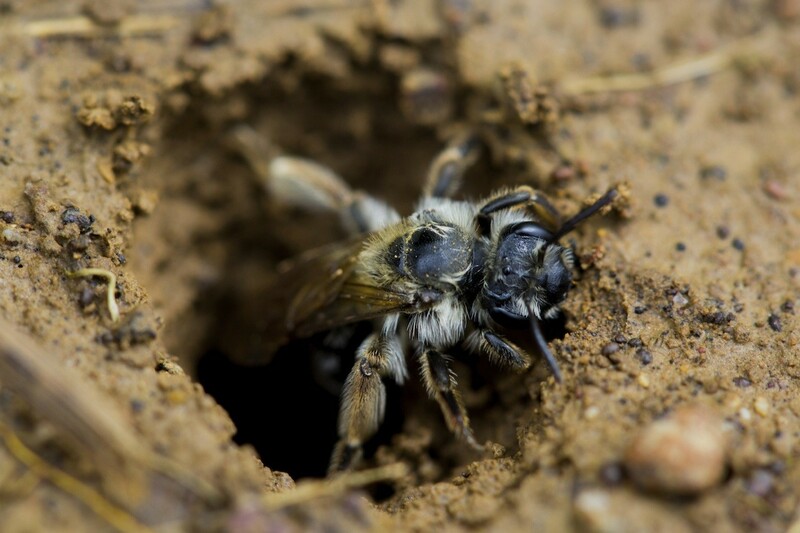 There are many species of digger bees that might be active in your yard so trying to be specific about when eggs are hatching or developing is not possible. What we do know is that in any month during the spring, summer or fall, there will probably be eggs hatching or at least, some stage active. To prevent these stages from continuing the problem, you should treat using the Adonis listed above. It will last several months and is highly effective on all types of grubs and adult insects found in soil turf as our article explains. Treating 1-2 a year will stop all part of their life cycle and assuming you’ve already treated as our article above explains, the Adonis will effectively eliminate them for good.